I wanted to let you know that we continue to be very pleased with the trouble free performance of the solar electric PV panels you installed for us almost 5 years ago. If I did not mention it at the time, thanks again for the excellent job you did of installation. I especially appreciated that the work was done on the schedule you provided and within the cost estimate you showed us before work began. It is, of course, really super to be getting a monthly check from PNM for the solar electricity the system produces in excess of what we use. I enthusiastically recommend Select Solar to people I meet who are considering installing a solar PV system, in fact please feel free to give my name to clients who may like to speak directly to one of your customers. If Select Solar could use a company motto here is a good candidate: Plants get all their power from the sun and so should we! Best wishes for continued success to you and to Select Solar. We were very pleased with Select Solar from the start to finish of our project. We consulted with several of the larger solar installers in Albuquerque beforehand and found their sales approach to be just that, based on "making a sale". Greg from Select Solar was very service oriented and had detailed technical responses to our questions. We enjoyed that sales approach and the detailed energy and financial analysis in their proposal. Our system is worry-free, basically maintenance free and producing even more energy than the projections! 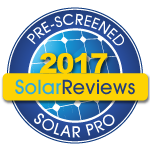 My wife and I chose Select Solar, LLC to install a photovoltaic (PV) system after lengthy research and talking to other solar installers. What impressed us first was how easy it was to talk with Greg Mechels and how knowledgeable he was with the current state of the solar industry. We had two requirements in reducing our electrical cost; find a way to reduce our daily demand and then create supplemental power that we would use in our house and feed back to the local electric grid. Greg did a thorough electric evaluation of our house and how we live. He suggested that we first change out our halogen floods to light emitting diode (LED) bulbs. This change reduced our lighting wattage by 80% in our most used rooms and the bulbs will last more than 10 years. These bulbs not only drastically reduced the heating load where used, they also made it possible to decrease the number of solar panels to reach our goal of cutting our electric bill by nearly 50%. Together we researched many options for the PV installation, including placement (roof or ground), manufacturer, warranties and the ecological impact during production of the PV panels, plus the converting of the direct current (DC) from the panels to alternating current (AC). Greg gave us many options and was very patient with our decision making process. After we made our decisions, Greg handled all the details, including the federal and state paperwork. We never felt that anything was overlooked. The installation went very smooth and we are now enjoying producing our own electricity and reducing our carbon footprint. We highly recommend Select Solar to all our neighbors and friends. Thank you Greg and Select Solar. I first had contact with Greg Mechels at a local remodel show. I have always been interested in energy issues and how to get the most benefit for the least impact on the environment. I had a long discussion with Greg on solar energy, mercury contamination, status of LED lights and more. I was impressed with his deep knowledge of the issues. I decided I was interested in solar panels but wanted some time to think about it. But I asked Greg to show me the status of LED lighting and recommend optimal substitution of my kitchen halogen lights for LED. Greg visited and left me with a large number of LED lights of different types, much higher quality lights than I had found in stores, that I could experiment with. I made a decision to change all my kitchen lights to LED, which included recessed ceiling lights and under-counter lights. I have a big kitchen and when all the original halogen lights were turned on I used around 1 kilowatt of power, now, I use around 150 watts. I showed it to my general contractor who had previously remodeled my kitchen. He said nice. But I learned later he was really impressed because persons completely unknown to me approached me and said your contractor raved about your kitchen lights when he finished remodeling my kitchen, unfortunately we had already done the lights, otherwise I would have chosen LED lights too. Some time after the LED work I made the decision to install roof solar panels. Greg took care of all the (enormous amount of) paperwork, I could just sit back and relax. The installation is very high quality and professional. It is somewhat expensive, so with current electricity prices I will about break even, but as we know prices only go up. I have had the installation for more than 6 months and it is producing above projection. I particularly enjoyed Greg's expert knowledge about any related energy issue I brought up. I even heard that when the county wants to know something they should know they call him up. I just regret I do not have any more work to be done at the moment, because it was such a pleasure dealing with Greg. I can highly recommend his work.